Pictured abouve is my much loved, favourite spot and happy place: my vanity. I thought I’d share the products that I have used to create this place as some inspiration and a little tour of my dressing table. Ikea ‘hermes’ dressing table in white. The Ikea dressing table is so stunning, I absolutely love it. It retails for around £145 and has storage, a mirror, glass top (convenient for makeup) and solid sturdy table. When I was searching for a vanity, they all seem to come in several pieces making it really expensive. I love how this all matches and comes as one as well as being such a beautiful piece of furniture. The white is so pretty and makeup wipes away relatively easily. I paired the dressing table with white accessories such as the chic chair from TKMaxx. Although now slightly worn, it did look so nice and was such a bargain due to the shops heavily reduced prices of quality items. The chair is leather with a silver metal base and is so comfy; it’s the perfect size. Some useful items I added include the ikea bin (seems to always be full- it’s a great spot to have a bin) and a crystal mirror with a close up side from TK Maxx (great price). 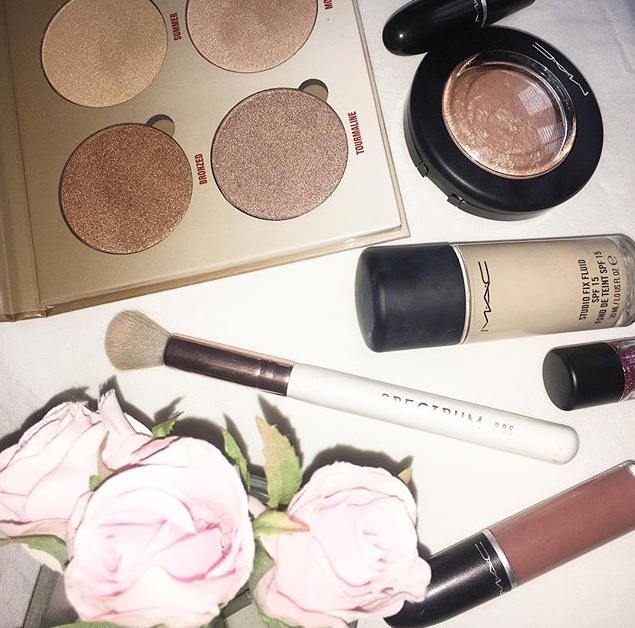 As well as this, something I highly recommend adding to your vanity: a floor lamp that can be moved to any position to allow makeup application at what ever time of the day/weather and great lighting. With much of the basics being white, I accessorised my dressing table with photos and tags of brands I love, fairy lights and dressed the two draws that sit on the table. Inside the left draw is all my hair ties, tweezers and scissors (brow and hair stuff) and the right holds watches and sunglasses. On top of the left draw, I placed a pretty pink and marble book (TK Maxx -they have an amazing note book section) with some fake pale pink roses (Tk Maxx again, there’s kind of a theme here haha). Just in front I place any perfume samples I have. On the right is my little pandora place where I store all my earrings and rings in front of a picture perfect Pandora bag. For best storage I removed the foam out of the middle box to store all my rings at the same time. As if I couldn’t love the dressing table any more, it has a large hidden draw just below the surface where I store all of my skincare and contact lense things. One small negative, like the Ikea Alex drawsis that the draw goes too far back making it in accessible but it’s nothing that would put me off purchasing it again.